When you want a tasty meal that reminds you of home without the mess to clean up, come in to Studebaker’s Country Restaurant. Whether you need a hot meal to start off the day or you just want a family friendly place for dinner, you’ll find exactly what you are looking for. You don’t have to spend a fortune to have an enjoyable meal. 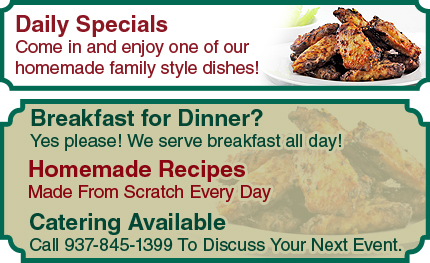 Our family style cuisine is sure to please even the pickiest eaters. Are you hungry for some home cook’n? Come on into Studebaker's Country Restaurant at 416 N Main St for a delicious meal just like your mom used to make. You can also order carry by calling 937-845-1399.